PEDRO, Ohio -- A suspect has been taken into custody in the slayings of four people, including an 8-year-old boy, who were found fatally shot in a southeast Ohio home. The bodies of the three adults were found in a trailer home in an unincorporated area of Lawrence County at about 7:30 p.m. Wednesday, officials said. The child's body was discovered later. Another man who lived in the home was stabbed and seriously injured. Officials had launched a massive manhunt for 23-year-old Aaron Lawson, who is charged with multiple counts of murder. "Today may be Friday the 13th, but it's a good day in Lawrence County, because we've captured one of Lawrence County's most wanted," Lawrence County Sheriff Jeffery Lawless said at a press conference Friday. The gruesome scene was first discovered by the stabbing victim, who returned home from work and was then stabbed in the head and neck by the suspect, Lawless said. He was able to escape and drive to seek help at the residence of a relative of the shooting victims, about a quarter mile away. He was flown to a hospital in Huntington, West Virginia. Authorities had initially issued a missing child alert for an 8-year-old boy, Devin Holston, who lived at the home where the bodies were found and couldn't be located after a search of the area, but then canceled the alert. Authorities said later Thursday afternoon the body of an 8-year-old was found inside the home. They said the child's body was put in a place where it was "hidden" and wasn't discovered until after the initial search. 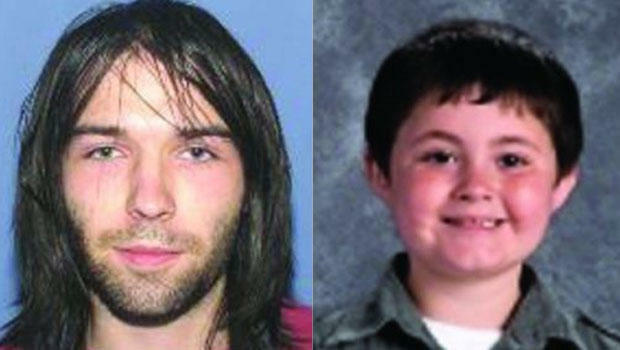 "We no longer have a missing child, what we have here is a horrible, horrible tragedy," Lawless said Thursday. On Friday, Lawless identified the deceased child as Holston. The three slain adults are identified as 50-year-old Donald McGuire, 43-year-old Tammie McGuire, and 28-year-old Staci Jackson. Lawless said that all those involved were "related in some fashion," but it wasn't immediately clear how the victims were related to each other. Lawson is Tammie McGuire's cousin and had spent time in the home, Lawless said. Around 12:30 a.m. Thursday, deputies spotted Lawson in a blue truck in Ironton, about 15 miles south of where the victims were found, the sheriff said. Deputies chased Lawson before he crashed his vehicle into a ditch and ran into the woods, the sheriff said. Lawless said the work of local, state and federal law enforcement who "saturated" the area and set up a perimeter that helped contain Lawson's movements helped lead to his arrest Friday. He also thanked the public -- it was a tip from a citizen who saw Lawson walking down a road that tipped off authorities to his location, Lawless said. Lawson didn't attempt to flee and was "willing to give up," Lawless said. "I think he was just plum worn out from being out in the elements," Lawless said. Lawson is facing three counts of murder and one count of aggravated murder, Lawless said. He could face additional charges. The bodies were being transported to Montgomery County for autopsies. The coroner's report and an investigation by the Ohio Bureau of Criminal Investigation would help determine the timeline of events and when the victims were slain, Lawless said. Lawless couldn't speak to a possible motive. The initial report about the slayings -- violence against multiple people found at trailers belonging to related residents -- recalled details from a still-unsolved homicide case that rattled rural southern Ohio last year. In April 2016, eight members of the Rhoden family were found shot to death in four homes in the Piketon area. The deaths on Wednesday occurred roughly 40 miles southeast of Piketon. A spokeswoman for the Ohio attorney general's office said Thursday that investigators have no indication of a connection between the cases.